The Crown is closing its case against former engineer Robert Wood in Ontario Superior Court by arguing he did not do his job diligently when he was hired to inspect the Algo Centre Mall in Elliot Lake, Ont., in 2009 and 2012. 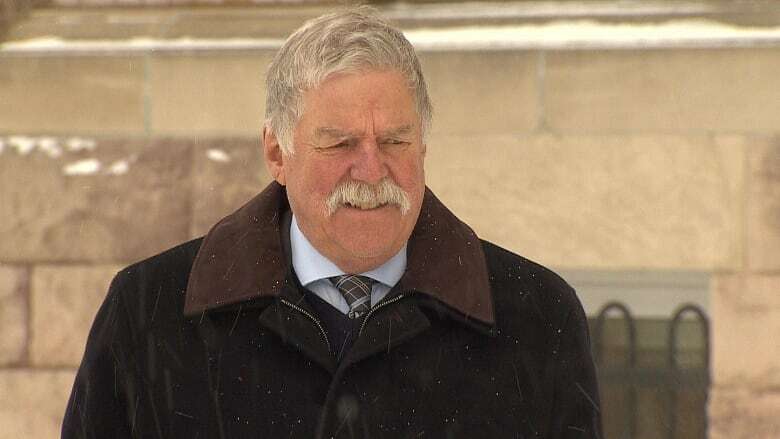 "Wood had a duty to his client and duty to the public at large," Crown attorney David Kirk said during his opening remarks on Wednesday to Justice Edward Gareau. "Wood had two opportunities to recognize the obvious and take corrective actions, but he failed." A part of the shopping centre's rooftop parking deck caved in above a lottery kiosk and food court on June 23, 2012 — two months after Wood gave the building a clean bill of health. Lucie Aylwin, 37, and Doloris Perizzolo, 74, were killed, and Jean-Marie Marceau, 80, suffered significant injuries when the roof gave way. Witnesses testified earlier in the trial to hearing rumbling coming from the parking deck when certain vehicles drove over it. One person told the court she stopped going to the rooftop out of fear a car might go through. The Crown has submitted photo evidence of missing ceiling tiles, buckets collecting dripping water, hanging tarps and rust taken from people who were concerned about the building's decline. Bonnie Ladell, the Crown's second witness, took a picture of large holes in the mall's drywall 49 days before Wood's last inspection. "That escaped the critical eye of an engineer," Kirk asked. "If people who are untrained can figure it out, why can't we just hire Ms. Ladell?" Wood has been waiting for these final days in court since he was arrested on Jan. 31, 2014 in Sault Ste. Marie, Ont., where his trial is taking place at his request. He has pleaded not guilty to two counts of criminal negligence causing death and one count of criminal negligence causing bodily harm. Wood's lawyer Robert MacCrae finished his closing remarks on Wednesday by telling the court the Crown has been unable to prove criminal negligence because engineering evidence is subjective. "The court cannot get into the mind of an engineer who makes a judgment call," MacRae said. MacCrae also took aim at the mall's owner Bob Nazarian for not telling Wood that the building had leaked since the day it was built, and that it was not made watertight in 2010 even though Nazarian received a city order to do so. "Nazarian's evidence was not truthful," MacRae said. "[It] cannot be relied upon by this court except for proof ... He withheld very important information." Nazarian has not been charged in relation to the Algo Centre Mall collapse, and none of the allegations against him have been proven in court. MacRae noted that the mall was approximately 200,000 square feet so "it does happen that things get missed." Kirk said if the court considers MacRae's arguments, any engineer can do "shoddy work." Kirk is expected to continue his final remarks when the trial resumes Thursday morning.